Highlands County is a great place to call home. Whether you are retired, raising children, or any other family arrangement, there is something here for everyone. Having over 9,000 acres of fresh water in your back yard to enjoy tempers the need to "get away", However, for the times you do want to explore more of the Sunshine State, you'll be pleased to know that Highlands County is very centrally located in Florida. 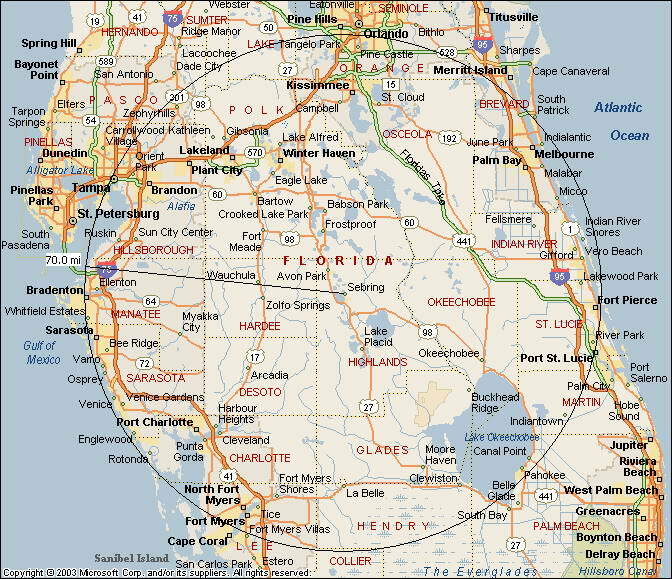 From the map below, you can see that Tampa, Orlando, Lakeland, Sarasota, Ft. Myers, Melbourne and Ft. Pierce all all within an easy 70 mile radius of Sebring. And while those cities, like all good sized cities, have the traffic challenges and population density that comes in a larger metropolitan area, Sebring doesn't. This means that you can enjoy the trappings that a larger city has to offer when you want it, and escape back to the relative tranquility that a smaller town life offers when you are ready to come home. And it's not like Sebring is a backwater town with no amenities. Quite the contrary, in fact. Sebring's commercial growth has been explosive recently. The first link below lists a few of the mostly non-fast food restaurants and shopping opportunities available within 3 miles of our home so you can see what we are talking about. When you're tired of shopping and eating, and desire some culture, then check out the South Florida Community college performing arts series. They feature big name artists and performers in an auditorium small enough that you can actually see the participants.